Still from Sephora Favorites Draw the Line collection, I think this Urban Decay 24/7 Waterproof liquid eyeliner deserves its own blog post. I don't consider myself as a liquid-liner person just because it can get messy when I'm in a hurry. I still need to work on my stability, too. But this liquid liner is really easy to work with. It does pretty much similar job with any good liquid eyeliner in general, but what special about it is that it doesn't run down under your eyes or your upper lids throughout the day like some liquid liners do. It dries pretty much matte with no shimmer, which always good for everyday use. I don't use it everyday though, because liquid eyeliner can make your look more harsh that usual just because the intensity of black it provides. When I want a more natural look, I always go with a matte black eyeshadow (panther from wet 'n wild is great) and smudge it with my $1 elf smudge brush. It also comes in 11 different shades which is pretty awesome for those who like to experiment with colors. For $19, I'd say it is a pretty good deal, although I'd prefer to save the money for the Kat Von D instead. 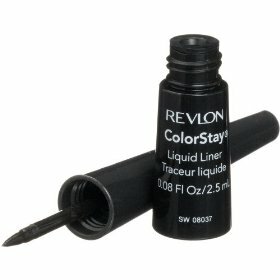 Drugstore alternative for liquid eyeliner with similar lasting power is Revlon Colorstay Liquid Eyeliner. It is Emily-recommended, and her recommendations rarely let me down. Just sayin'. Although, I have to say, the stiff-er brush could be an advantage or a downer depending on your preference. I find it easier to work with because I don't have the stablest hand when it comes to applying liquid eyeliner, but it also limits the 'flick' flexibility if you know what I mean. You have to draw the line thoroughly when you want to create that "winged" effect.